Lets get a little fresh air today! Here's a great view of the famous outdoor shopping and dining district, Nicollet Mall, in downtown Minneapolis (still there today), with an old W. T. Grant Co. store visible on the right. No idea what W.S. Grant sold, but their store sure looks pretty. W. T. Grant (not W. S.), if I recall correctly, was kinda like Kmart. W.T. Grant was a five and dime store (like woolworth's). The store on the left is the old Donaldson's department store. W.T. Grant was huge in its day. 1200 stores coast to coast. That they were. Grant's had huge discount stores in larger cities here in WI. Nicolet Mall is actually also a collection of smaller enclosed malls, though I don't think these came until the early 1980s. City Center and Crystal Court were two of three or four enclosed sections. Donaldson's would become Carson Pirie Scott in the '80s before folding in the early 1990s (with the rest of the Minnesota stores) Dayton's was obviously the other huge store. There was a giant Woolworth store here too if I'm not mistaken. I'll bet Mary Richards shopped here. Wow, it's still there? Here, they've taken back the streets and returned them to their rightful owners: the car (I say that cynically). Maybe the Grant department store was owned by Mary's boss Mr. Grant or his family, it would only make sense. Is Donaldsons in the photo? I don't see it. Kind of looks like the area Mary Tylar Moore threw her hat into the air because she knew she was going to make it after all. Actually, Mary's "date" was her real-life husband at the time, Grant Tinker. Wonder if that is who the character Mr Grant was named for? Does anyone know anybody interested in writing a brief history of Donaldson's Department Store? Ideally the author should leave in the general area and have some tie or connection. Check out The History Press's website, www.historypress.net for more information about our books and our company. We are a traditional, full-service press, which means the author have no financial investment, and that they would receive royalties from book sales. Contact Allison at allison.evans@historypress.net for inquiries. 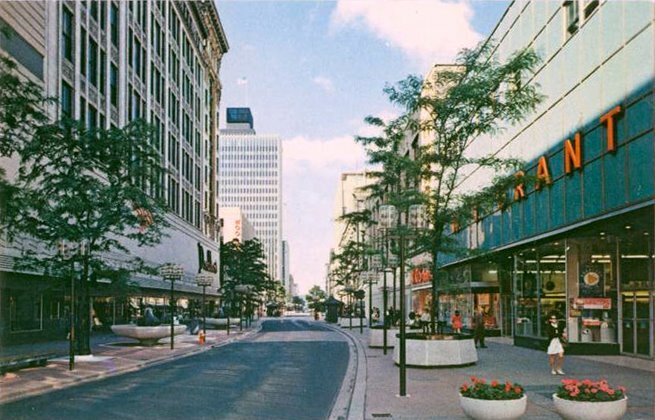 Nicollet Mall - America's original "lifestyle center."